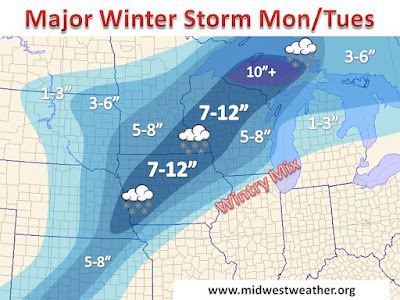 A strong cyclone will move into the Midwest Monday into Tuesday from the south. Ample moisture and enough cold air will be in place to drop excessive amounts of snow across the area. This system is already responsible for 3 FEET of snow in West Texas and is poised for the Midwest. We will not see quite that much, but many areas have the potential to reach a foot of snow with this system. Exactly where the heaviest bands set up will play a major role in who sees these high totals. Western Iowa to far southeast Minnesota looks to be in the hot zone for the heaviest snow, with the U.P. of Michigan also seeing some lake enhancement, where totals over a foot will be common by Tuesday. Another complication to the forecast and travel conditions will be some sleet and freezing rain mixing in for a period of time in eastern Iowa and southeast Wisconsin. Warm aloft, will poke in from the southeast and create a narrow layer of melting. Just how far that can get north will effect snow ratios and snow totals. While this may cut into totals a tad, snow and sleet accumulations will still be substantial across these areas, a winter storm warning is in effect across these parts and points north and west. 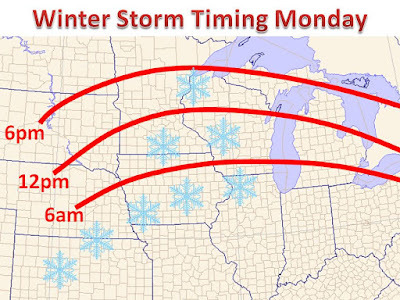 On the right is the expect start time for either snow (in Iowa, Minnesota and Wisconsin) or sleet/rain (in Michigan). Once the band reaches you area, expect it to stick around for 18-24 hours. The snow will be heavy at times, with snowfall rates of around an inch an hour expected during the height of the event, before wrapping up late Monday night into Tuesday morning. 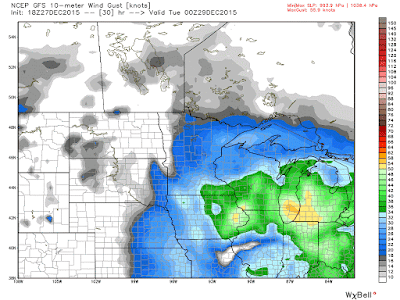 Some flurries and snow showers could linger into Tuesday across Minnesota and Wisconsin, as cold air aloft works into the area, snow totals less than an inch expected Tuesday. Furthermore, gusty winds in Eastern Iowa and Southern Wisconsin will also bring major issued to the areas. Combined with the freezing rain potential, wind gusts over 40mph could cause major issues, including power outages. 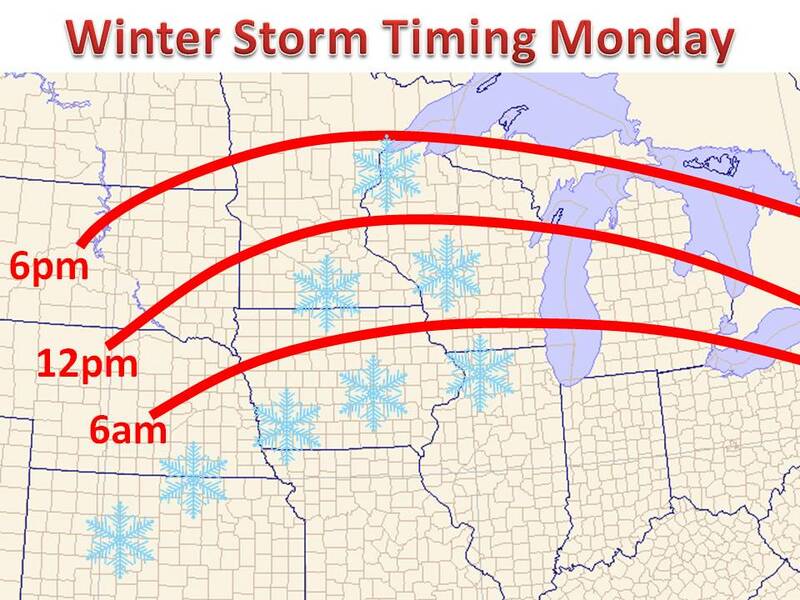 Blizzard criteria may be reached in southern Wisconsin and parts of Iowa tomorrow afternoon. This will need to be watched closely heading into Monday. The map on the left shows the GFS modeled peak wind gusts Monday evening, courtesy of weatherbell. Thanks for stopping by Midwest Weather and be sure to like us on Facebook and Follow me on Twitter!